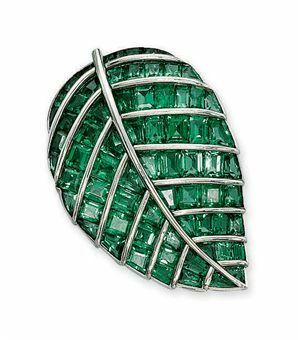 Provenance: Sotheby's, Hong Kong, 27-28 April 1993, lot 163. Notes: This handsome pair of vases display an exuberant complexity of form and decoration that can be seen on a number of vessels made for the Qianlong emperor. Several published Qianlong vases have mouths which turn down in a series of pendant ruyi. 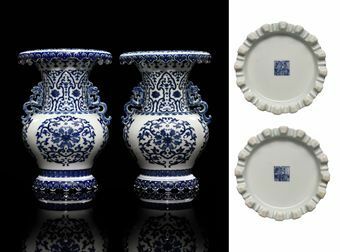 Two blue and white vases with similar turned-down ruyi mouths decorated with lingzhi fungus have been published; one from the collection of the National Palace Museum in Porcelain of the National Palace Museum: Blue-and-White Ware of the Ch'ing Dynasty II, Hong Kong, 1968, pp. 40-1, pl. 10; the other was sold in these rooms on 11 July, 2006, lot 142. The turned-down mouths seen on Ming and Qing dynasty porcelains may ultimately derive from the vases with lobed turned-down mouths made in the 12th and 13th centuries. These latter vases were made at the Jun kilns and the Cizhou kilns, as well as among qingbai porcelains from the Jingdezhen kilns (see R. Kerr, Song Ceramics, London, 2004, p. 32, no. 22; T. Mikami, Sekai Toji Zenshu 13 Liao Jin Yuan, Tokyo, 1981, pp. 110-11, no. 92; and S. Pierson (ed. ), Qingbai Ware: Chinese Porcelain of the Song and Yuan Dynasties, London, 2002, pp. 136-7, no. 71). 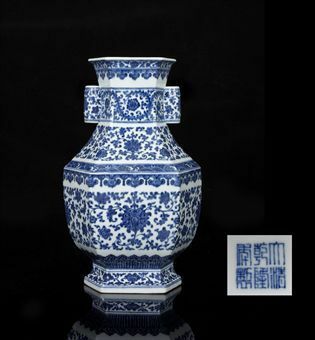 The first appearance of turned-down mouths on blue and white wares from the Jingdezhen kilns appears to be in the Xuande reign, on vases such as the vessel illustrated in Catalogue of the Special Exhibition of Hsüan-tê Imperial Porcelains of the Ming Dynasty, Taipei, 1998, pp. 80-1, no. 13. However the distinctive ruyi or lappet-shape of the down-turned mouth on vessels such as the current pair of vases appears to be a Qianlong innovation. It can be seen not only on blue and white vases, but also on a famille rose vase in the Palace Museum, Beijing (illustrated in Views of Antiquity in the Qing Imperial Palace: special exhibition to celebrate the 80th anniversary of the establishment of the Palace Museum, Museu de Arte de Macau, 2006, p. 25, no. 52); on another famille rose vase in the Palace Museum illustrated in The Complete Collection of Treasures of the Palace Museum - 39 - Porcelains with cloisonné enamel decoration and famille rose decoration, Hong Kong, 1999, p. 137, no. 120; while this type of neck can also be seen on a gu-shaped, celadon-glazed, vase from the same collection, illustrated in Kangxi, Yongzheng, Qianlong - Qing Porcelain from the Palace Museum Collection, Hong Kong, 1989, p. 461, no. 143. The current pair of vases is distinctive because the pendant ruyi at the mouth are balanced by similar ruyi at the foot. These lower ruyi, are not simply painted, but are cut to give the foot a much greater lightness, as well as matching the mouth detail more precisely. The fact that the vases were then fired on the lower edges of the ruyi, rather than on a solid edge, would have made firing considerably more difficult, which may explain the rarity of this feature. The form of the elaborate dragon handles on this pair of vases is also distinctive. The general form of the handles, and especially the feature of the dragon's head being turned away from the neck of the vessel, can be seen on the handles of a large Qianlong doucai dragon flask in the collection of the Palace Museum, Beijing (illustrated in The Complete Collection of Treasures of the Palace Museum - 38 - Porcelains in Polychrome and Contrasting Colours, Hong Kong, 1999, p. 278, no. 254. Notes: The most prestigious decorative motif seen in the three-dimensional arts made for the Chinese imperial court in the Qing dynasty is the Imperial dragon - the symbol of the Son of Heaven, the Emperor himself. 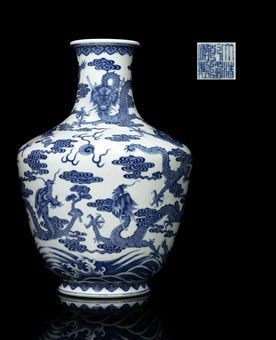 The Imperial dragon, a powerful creature with five claws on each foot and horns on either side of his head, provides the decoration for this exceptional blue and white porcelain vase. In this case there are nine dragons, and this use of the sacred number nine reinforces the imperial connection, and suggests that the vase was intended for the Emperor's personal use, possibly even an imperial birthday. The dragons on this vase are especially powerful and well painted. The heads of the creatures are painted with particular skill - each depicted with a different expression and from a different angle. A famille rose and blue and white example with similarly painted dragons and clouds is illustrated in New History of World Art, Volume 9 - Qing, Shogakukan, Tokyo, 1998, pl. 182. The use of lingzhi fungi in the decoration on the vase, some clasped in the dragons' claws and others appearing as stylised motifs around the mouth, provides an auspicious wish for their imperial owner. Lingzhi fungi are symbols of longevity, partly because the species of fungi that inspired them turns woody with age and appear to survive indefinitely. They are also believed to grow near the springs in the lands of the immortals. Not only did these fungi wish the Emperor long life, they were also a compliment, since it was believed that they would only appear when a virtuous ruler was on the throne and the empire was peaceful and prosperous. Notes: A number of these tall, high-shouldered vases are published, one formerly from the Edward T. Chow Collection, was sold Sotheby's Hong Kong, 19 May 1981, lot 546; a vase from the Eugene O. Perkins Collection, sold Sotheby's New York, 2 June 1989, lot 90; and a pair from the T. Y. Chao Collection, exhibited at the Hong Kong Museum of Art, 1978, Catalogue, no. 79. 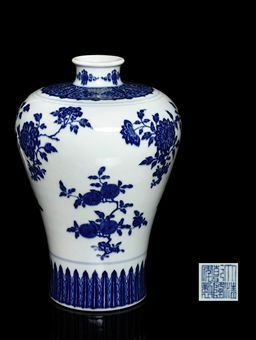 One of this pair of vases is now in the S. C. Ko Tianminlou Collection, and is illustrated in Blue and White Porcelains in the Collection of Tianminlou Foundation, Hong Kong, 1996, p. 222, no. 94. The inspiration for this shape and pattern originates from examples produced during the early Ming period, cf. a 15th century meiping in the National Palace Museum, Taipei, illustrated in Blue and White Ware of the Ming Dyansty, Book II (part I), pl. 1. 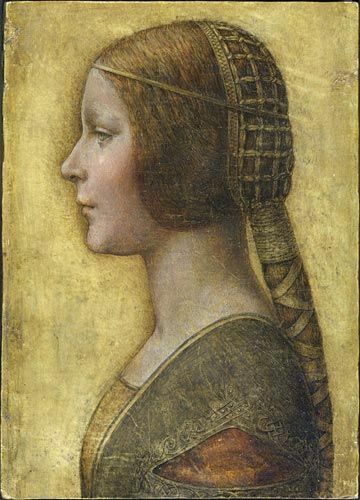 Provenance: Christie's, London, 25 July 1977, lot 52. Notes: A Qianlong period vase of this form, although with different decoration, was included in the National Palace Museum, Taiwan, Special Exhibition of K'ang-hsi, Yung-cheng and Ch'ien-lung Porcelain Ware from the Ch'ing Dynasty, Taipei, 1986, no. 68. Other related examples are illustrated by X. Ma, ed., Beauty of Ceramics: Blue and White Porcelain, Taipei, 1993, pl. 154, and by Misugi Takatoshi, Blue and White Ceramics of the World, vol. 3, Kyoto, 1982, pls. 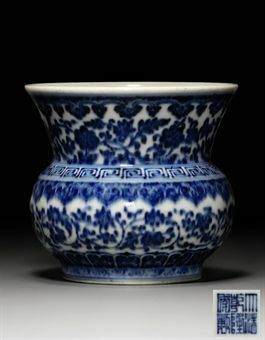 68a-c.
Notes: A very similar vessel was sold at Sotheby's Hong Kong, 5 & 6 November 1996, lot 815. A fine imperial blue and white meiping, china, qianlong six-character seal mark and of the period.